More than ever, cell phones and mobile games are tightly intertwined. Looking at some cell phones, you can't help but wonder - is this a phone or is it a gaming console? Case in point is the phone shown above. It is the Nokia N-Gage QD, one of the early trendsetters and best cell phones for gaming. With cell phones like these, let the games begin. Featuring an original storyline with an irresistible cast of characters, Shark Dash is a cartoon-style physics puzzle game. Sharkee and his merry band of toy sharks take on the mischievous ducks that kidnapped Sally. A big hit since its release, this arcade game can be played on iPhone and Android smartphones as well as the iPad. 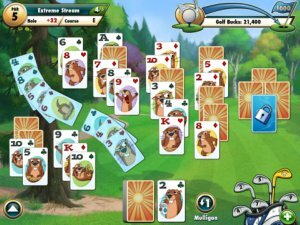 Fairway Solitaire weaves a golf theme and virtual currency into a familiar card game and spins it into a fun mobile experience. But this mobile game for iPhone, iPad and iPod touch does not rely on the luck of the draw like most solitaire games. As in golf, the Fairway Solitaire allows the player to use different strategies at various points in the game. Complete with a comical storyline, witty game announcers, and an animated gopher, it features more than 60 golf courses. Big Fish Games Studios plans course updates. Long after you watched Fantastic 4 mobile game on the big screen, your cell phone reminds you of scenes and voices from the movie. Thanks to a suite of Fantastic 4 mobile products - games, wallpapers, cell phone themes, voice tones, ringtones and ringbacks. The captivating interactive adventure, Nokia 20Lives game, follows the tradition of the highly popular Nokia Game. The hunt for free games for cell phones can be much ado about nothing unless you know how and where to look. Several options for freebies include teaser downloads, games bundled with other purchases such as buy-one, get-one free, and ad-supported mobile games. According to M:Metrics mobile consumption data, 48 percent of the games for cell phones offered by carriers are sports and action/adventure titles. Arcade puzzle games like Tetris and card games, which are universally popular, account for 10 percent. But mobile games keeping breaking new ground, like video-enhanced games and pay-per-play games. The DVD game Scene It? Movie Edition is mobile. Namco Networks and Sprint say it is the first mobile game in North America to integrate video clips into the game play. Sennari is leading the charge in a new trend in games for cell phones - rewards programs for your gaming skills. The company's PrizePlay lets you accumulate and redeem prizes to encourage repeat play and customer loyalty. A free boxing game for cell phones is pitting political heavyweights against one another in a virtual ring. The Mobile Ring by Cellufun has something for everyone - Democrats, Republicans or Independents. You can play the game as any of the presidential election contenders. To download the free game, point to The Mobile Ring - WAP on your phone’s browser. And, catch this video of the "trash talking" candidates. Other Cellufun free games for mobile phones include Call of the Pharaoh, Space Wars, MobilePet myPhone, as well as downloadable games Chess, Sudoku, The Battle for Orion’s Belt and Why Chicken Why. A plug-in for GoWare's DoMo HomePage personalized mobile portal allows players of the popular World of Warcraft MMORPG to access and share WoW character data via mobile phone. Players automatically load their WoW character into their DoMo HomePage, then when friends ask about their character, players have the answer right on their cell phones. For iPhone users, check this out - iPhone Apps For World Of Warcraft. The DVD game Scene It? Movie Edition is mobile. Namco Networks and Sprint say it is the first mobile game to integrate video clips into the game play in North America. Featuring trivia categories like Invisibles, Take 3 and Rising Star, Scene It? Movie Edition lets you relive great Hollywood movie moments with text, audio and video questions. For a free demo text "movie" to 26262 on your Sprint or Nextel cell phone. Sennari is leading the charge in a new trend in games for cell phones - rewards programs for your gaming skills. The company's PrizePlay is a suite of pay-per-play games that lets you accumulate and redeem prizes to encourage repeat play and customer loyalty. PrizePlay games for cell phones include titles like Monopoly, Snakes and Ladders, Triple Towers (Solitaire), Mahjong, Star Trek, Poker Battle and Goldenballs (Pachinko). T-Mobile offers the gaming service; it is also available through Ericsson, Hasbro, Verizon Wireless and others. Here's a sampling of great games for cell phones. Check back for periodic updates. Funkyball Worlds, a physics-based platform game in which players guide a realistically weighted Funkyball across platforms using a combination of accelerometer and multi-touch controls to roll, slide and jump through different worlds. TEKKEN 2, mobile version of the popular arcade and console game series, challenges you to master 10 hit combos, powerful moves and crushing counters as you take on seven characters for King of the Iron Fist. Guitar Hero World Tour Mobile, lets you strum guitar strings and play the drums to the tune of your favorite songs, and features real-time multiplayer capabilities. Worst-Case Scenario, trivia game for mobile phones with rapid-fire questions, including dating, outdoor survival and politics. Peggle Mobile, strategy and skill game for cell phones blending pinball, pool and pachinko. Financial Football, free, educational cell phone game with an NFL theme is available by texting the word VISA to 24421. SWAT Elite Troops, sequel to SWAT Force by Vivendi Games Mobile. Shock Blocks, puzzle game for mobile phones by Vivendi Games Mobile. The Legend Of Spyro: The Eternal Night, epic adventure mobile game by Vivendi Games Mobile. Bookworm, word puzzle mobile game by PopCap. Contra 4 Mobile, review of action adventure cell phone game by Konami. Scene It? TV Edition, puzzler mobile game by Namco Networks. Diner Dash, restaurant franchise game for iPhones by Glu Mobile. Read Diner Dash 2 Review. Line Rider Mobile, virtual sledder mobile game by IN-FUSIO. Read Line Rider Mobile Review. The Settlers, strategy and economic simulation mobile game by Gameloft. Skate It, extreme, high-flying skateboarding game for iPhones by EA Mobile. Rush Hour 3, published by IG Fun. Ultimate Reversi, two-player logic game for iPhones by Superscape. Pirates of the Caribbean Multiplayer by mDisney. Ghost 'n Goblins by Capcom Entertainment. "24" The Mobile Game by Fox Mobile & I-play. Ice Age 2: Arctic Slide by Twentieth Century Fox & Glu Mobile. Brine Lacrosse by SkyZone Entertainment & Brine - Verizon, Nextel, Boost Mobile. Bode Miller Alpine Racing by Abandon Mobile & NBC Sports - Sprint, Verizon. Diner Dash, franchise cell phone game by Glu Mobile. UNO Challenge by Summus & Mattel. Wimbledon 2005 by Pixiem - Verizon. BMW WilliamsF1 Team Racing Challenge by InfoSpace Elkware Studio. Brunswick Billiard Challenge by Bandai - Sprint. 3D Field Golf by Bandai - Sprint. 3D Beach Mini Golf by Digital Chocolate - Sprint. 3D Extreme Air Snowboarding by Digital Chocolate - Sprint. Golf Club 3D by InfoSpace Mobile. A series of games for cell phones based on The Da Vinci Code movie is available worldwide through mobile carriers in more than 70 countries. Blaze Mobile Entertainment's release of the movie-based mobile games covers a number of different genres and player demographics. According to Blaze, The Da Vinci Code Helix and The Da Vinci Code Light Puzzle offer simple, engaging puzzle-type game play, while The Quest Begins and The Da Vinci Code 3D offer a more in-depth challenge. "By providing a number of different games and styles, we are giving every single mobile phone owner the chance to interact with and enjoy The Da Vinci Code on their handsets, whether they're new to the concept of mobile gaming, or an experienced videogame player," said Keith McCurdy, president and CEO of Blaze, now Oberon Media. The Da Vinci Code movie is based on Dan Brown's bestseller. The Gorillaz Entertainment System is an exclusive arcade game title from RealNetworks. It captures the irreverent nature and irresistible charm of Gorillaz, the world's first cartoon band and Grammy-winning group. The title features four easy-to-grasp, mini-games based on each of Gorillaz' band members; 2D, Noodle, Murdoc and Russel. 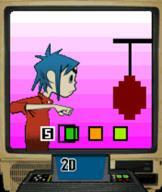 The graphic elements are a unique blend of retro arcade-style games for cell phones and the utterly contemporary Gorillaz artwork. Sometimes you want to call your friends to talk, but sometimes you just want to challenge them to a game showdown - over the cell phone. That's what Nokia had in mind with N-Gage, the first cell phone designed primarily for gaming and phoning. Driving the trend of realistic 3D games for cell phones is Golf Club 3D by InfoSpace. This game features real-time 3D animation, realistic environments and customizable players to deliver a complete and fully interactive golfing experience for mobile gamers. Golf Club 3D allows mobile phone customers to hit the links, playing through an 18-hole golf course in both single player and multiplayer modes. The 3D course graphics include sand traps, rough, waterways, fairways and greens that change the behavior of the ball, giving players a most realistic golf experience. The game is complete with weather effects and five unique camera views that allow players to witness the game from all angles. Players are also given the option to customize a player's appearance and receive detailed player statistics to further enhance their gaming experience. Wimbledon's officially licensed cell phone tennis games keep the great tournaments alive - for mobile entertainment - long after they have been played on the court. The mobile game series provide a realistic virtual tennis experience for cell phone players. Players can adjust the velocity of their serves, attack the net, and add spin to their shots. Mobile carrier AT&T Wireless offers Wimbledon in its lineup of games for cell phones. The Wimbledon games are compatible with select mobile phones by Motorola, Nokia, Samsung and Sony Ericsson. You can download Wimbledon 2012 Mobile to your cell phone.